This book is based on the field studies by John Hurrell Crook over five years in Africa, India, and the Seychelles. Crook made detailed observations on the behaviour of 26 species, having published over 20 separate papers on weaver biology. (2) "Analysis and Discussion" (pp. 69-157), giving a theoretical interpretation of the interaction of drives underlying each posture or display, a discussion of the evolution of displays and of variations in pair formation in different species, and concluding with some applications to taxonomy and phylogeny of the subfamilies. I. Courtship precedes or coincides with nest invitation by the male and acceptance by the female. This includes monogamous species like the Spectacled Weaver, malimbes, and fodies. II. Nest invitation by advertisement displays on the nest precedes courtship. 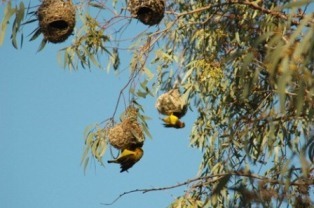 This includes the polygamous species, eg Cape Weaver (photo above), and the monogamous Red-billed Quelea. III. 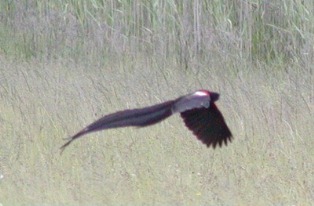 Aerial or perched advertisement of a territory, not a nest, precedes courtship within the territory. This includes the polygamous widows and bishops, eg the Long-tailed Widow (photo right).